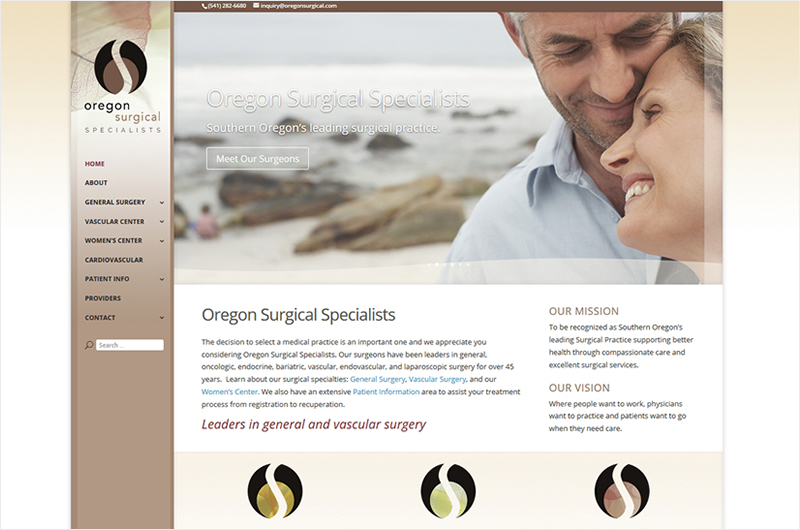 Leaders in general, vascular, and women-focused surgery, the Oregon Surgical Specialists’ site, though large, feels airy and streamlined thanks to a fluid navigation, accommodating layout, and soft color palette. The OSS family also includes Advanced Vein Center and Southern Oregon Bariatric Center, which use the same template. Another ruby slipper and Happy Dog Web Design collaboration. It has been a pleasure to work with Erin and Ruby Slipper creating our new websites at Oregon Surgical Specialists and Advanced Vein Center. Erin’s expertise and ability to deliver on a vision made it a smooth and rewarding project. We now have wonderfully intuitive and very attractive websites with improved functionality. Erin is a professional through and through and pushed herself to exceed the expectations we had….. And she Delivered!! I highly recommend her to anyone looking for a site that you would be proud to have represent your organization.